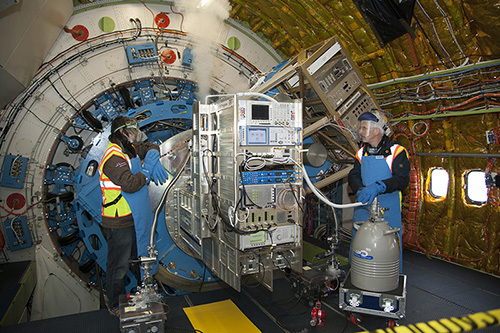 The German REceiver for Astronomy at Terahertz Frequencies (GREAT) is a Principal Investigator class Science Instrument. GREAT is a dual channel heterodyne instrument that will provide high resolution spectra (up to R=108) in several frequency windows in the 0.490–4.747 THz range. The front-end unit consists of two independent dewars, each containing a set of mixers. Offered for Cycle 7 are is the seven-beam array upGREAT in its Low Frequency Array configuration for the [CII] line at 158 μm and High Frequency Array configuration for the [OI] line. Also available for Cycle 7 are all four 4GREAT bands at the following frequency ranges: 490–635 GHz (Herschel/HIFI band 1), 890–1100 GHz (Herschel/HIFI band 4), 1200–1500 GHz (GREAT L1 channel), and 2490–2590 GHz (GREAT M channel). The backend for each mixer is a Fast Fourier Transform spectrometer (XFFTS). Each XFFTS has 2 GHz bandwidth and 64,000 channels providing a resolution of 44 kHz. The beam size of GREAT is diffraction limited (14.1” at 158 μm). Information applicable to the current observing cycle, Cycle 6, can be found in the GREAT chapter of the Cycle 6 Observer's Handbook. Those submitting proposals for Cycle 7 must refer to the GREAT chapter of the Cycle 7 Observer's Handbook. Be sure that you are referencing the correct version of the handbook!